A custom case Paulo made for his airbrushes. An airbrush is likely the most costly purchase you will ever make as a Gunpla builder. 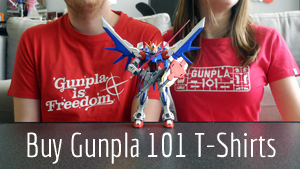 While not necessary to enjoy Gunpla, it is the most effective way to elevate the look and of your kits to a style that is all your own. Paulo of Otaku on a Budget shows how to pick one that’s right for you. For many Gunpla builders, acquiring an airbrush is the quintessential step towards achieving pro-grade paint finishes. While a select few are able to produce super smooth and even layers using nothing more than a regular paintbrush, airbrushing is generally the faster and more forgiving approach to painting mecha kits. It’s a new and exciting skill to master, and the wide variety of airbrush types and brands out there can make choosing the right airbrush a daunting task in itself. In this article we’ll go over some of the most popular choices in the airbrush market, highlighting their key features to help you understand what you can get at a certain price point, and hopefully give you peace of mind that you’re getting your money’s worth when you decide to pull the proverbial and pun intended trigger on your first (or next) airbrush purchase. The G233 from Chinese company Master airbrush is a gravity feed, double-action airbrush often sold as a 3-in-1 set which includes 0.2, 0.3, and 0.5mm tip combinations. It’s a budget-friendly package that lets you familiarize yourself with different tip sizes and their capabilities. The handle comes with an adjustable needle limiter for making consistent lines. Build quality is what you can expect for the price, and is not much better than generic models. You can use the alternate tip combinations as spares if you end up bending a needle or stripping some nozzle threads, which for a beginner is more a matter of when than a matter of if. Spare parts are inexpensive and interchangeable with most generic Chinese models. Verdict: It’s a great entry-level tool, but expect to graduate from it once you’ve honed your airbrushing skills through a couple of projects. Sparmax is a Taiwanese brand that makes quality airbrushing equipment more popular with makeup artists, but their products are equally suited to other airbrushing applications. The Max 3 is a double-action gravity feed airbrush that comes with a .3mm tip and is similar in design to the Master G233, but outclasses it by leaps and bounds in terms of build quality and atomization. This airbrush is also sold as the Tamiya Sparmax in some countries, and a 0.2 configuration is also available. Verdict: If you’re willing to trade the G233’s alternate tip configurations for a bump in performance, the Max 3 is an excellent and affordable upgrade. Badger is an American brand that has a solid following not only in model painting groups but in airbrushing communities in general. The Patriot is one of their top selling models, and for good reason. Also a gravity feed and double-action airbrush, the Patriot features a threadless and self-centering nozzle available in three tip sizes. A colored plastic ball on the rear end of the needle indicates the needle size, and makes it easier to pull the needle out for cleaning. It’s compact and simple design makes it easy to clean and control. Affordable and readily available parts means you can maintain and use it indefinitely. Verdict: Built to last, the Badger Patriot is a workhorse, and an absolute steal for its current market price. The Renegade Krome is another top-selling model from Badger, and the flagship of their Renegade product line. The bright chrome body and matching chrome cup lid add a touch of class to the design. The handle comes with a needle limiter and engraved dial to keep track of your favorite settings. A two pronged nozzle cap prevents accidental contact with the needle while still keeping it in full view for easy tip-dry cleanup. The Krome’s self-centering nozzle is much smaller than the Patriot’s and more difficult to clean, but the Krome atomizes paint as well as the best of them. It has an ergonomic plastic piece under the airbrush body that helps reduce fatigue during extended painting sessions. Often sold with both the 0.2 and 0.3 tip combinations in a classy aluminum case, this airbrush package is hard to pass up. Verdict: Priced a little higher than the Patriot, the Krome offers a few more features and kicks the build quality up a few notches. Iwata is one of the most popular airbrush brands out there. Made in Japan with the best materials, you can expect only the highest quality tools from this manufacturer, and the Iwata Eclipse is no exception. Their handpieces are polished to perfection all the way into the paint reservoir. With a similar nozzle design to the Patriot, but miles ahead in terms of quality it’s no wonder this airbrush is one of the most recommended, not just among Gunpla builders, but in the scale modeling community as a whole. What it lacks in features it more than makes up for in reliability. It comes with a .3mm tip capable of fine lines and broad patterns. Shown here is the gravity feed version, but a siphon feed (HP-BCS) model with a .5 tip is also available, and parts are interchangeable between the two (excluding the siphon bottle of course). Verdict: Whether you’re new to airbrushing or have been at it for years, the Eclipse will exceed your expectations. The Harder and Steenbeck Infinity is considered by many to be the holy grail of hobby airbrushes. Made in Germany and boasting the smallest tip size of 0.15mm, this airbrush claims to produce the finest lines possible at a fraction of the cost of the acclaimed Iwata Micron. The CR+ model shown here ups the ante by using a triple-chrome hypoallergenic finish, an adjustable needle limiter with a clever memory setting, and a proprietary threadless nozzle design. It features a unique trigger and a detachable color cup that makes reassembly and cleaning easier. PTFE seals ensure no air and paint goes where it shouldn’t, and a wide range of tip combinations that go up to .6mm lets the user choose the best setup for every job. Sold as a 2-in-1 or with a single specific tip size, few others come close to what the Infinity can offer. Verdict: Spares and parts are pricey but quality is unparalleled, so if you maintain it correctly you can expect the Infinity to last for decades. There are many other airbrush models with similar features to the ones listed here, but these six examples should at least enlighten you on what features you can get at a particular price range. Try not to assume that a more expensive airbrush is always better, or that upgrading your tool will immediately improve your painting ability. What works great for one artist may feel to clunky or too sensitive for another. The best airbrush will always be the one that you enjoy using the most, regardless of price or brand. About the contributor: Paulo is a mecha modeler from the Philippines and is the elusive nerd behind Otaku On A Budget – a mecha-modeling blog dedicated to discovering and sharing budget-friendly hacks, alternative tools and building techniques, to help fellow enthusiasts get the most out of this excellent hobby.